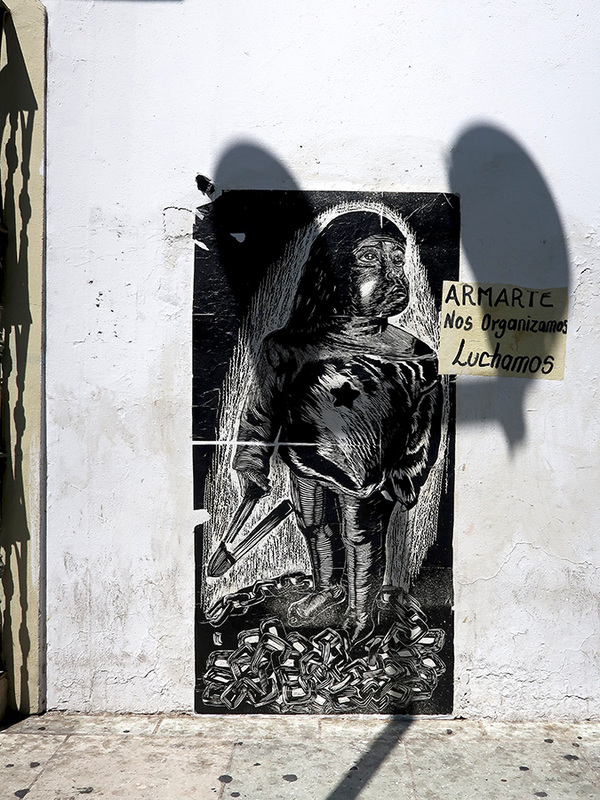 Armed with their art, the women of Armarte OAX have taken to the streets to raise their voices in struggle. In the early evening of International Women’s Day, thousands of women “reclaimed” some of the most dangerous streets of the city demanding an end to street harassment, punishment for rapists, the cessation of violence against women, and safe abortion. 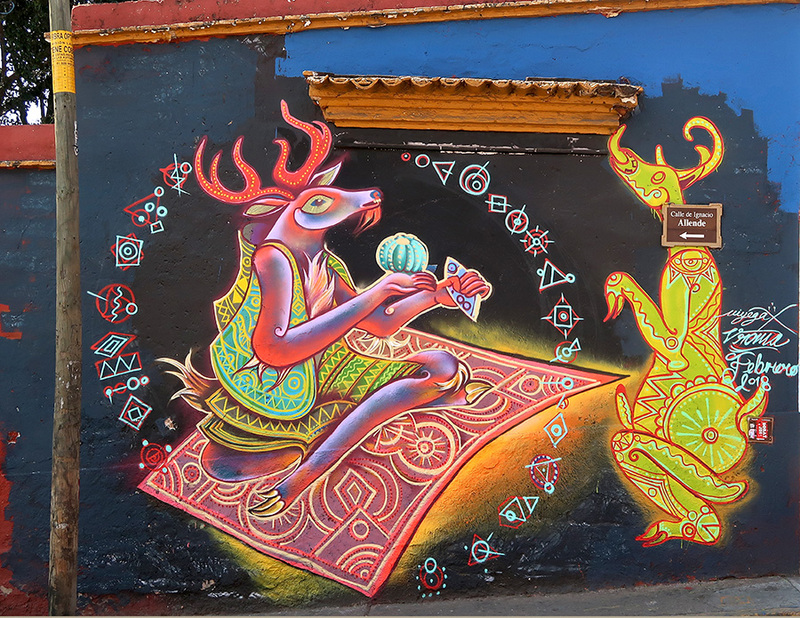 What an enlightened and wonderful contrast to the game of cat and mouse, street mural artists have been facing here in Oaxaca for the past few years, where many (including me) have been asking, are Color and culture, unwelcome? 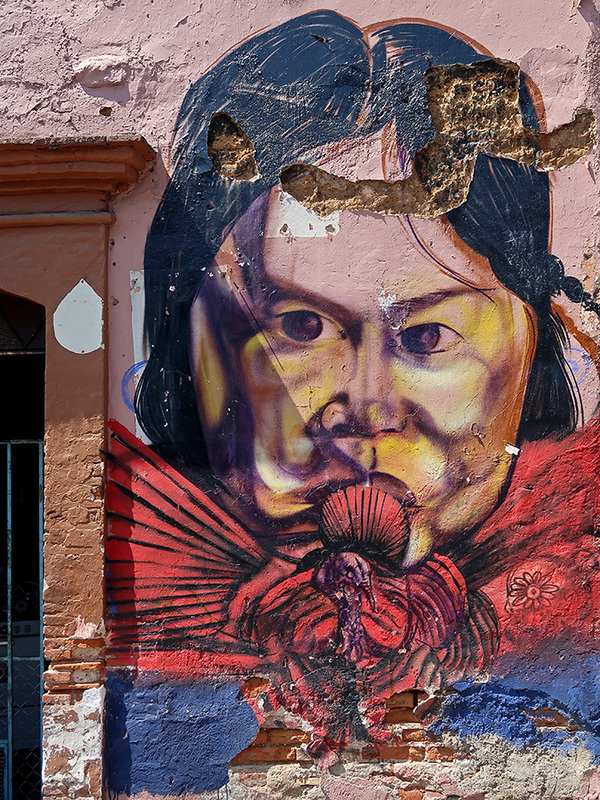 However, while they may be more ephemeral than we would wish, artists are still at work on the sides of our own crumbling buildings, and murals still can be found on the walls of Oaxaca. Enjoy them while you can, they may be gone tomorrow. If it’s Sunday, it must be market day in Tlacolula de Matamoros. 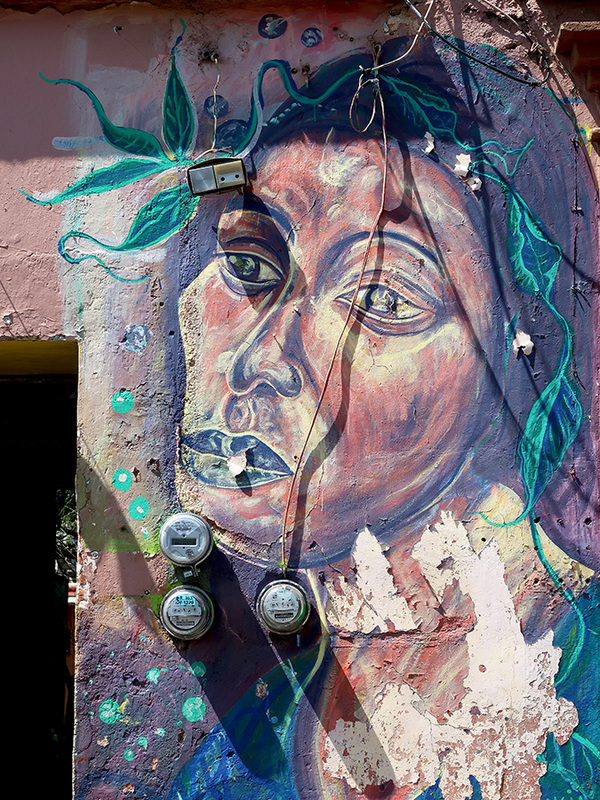 However, it’s not just the market (one of the oldest and biggest in Oaxaca) that keeps me returning, it’s also the prevalence of fabulous murals decorating walls and sides of buildings. 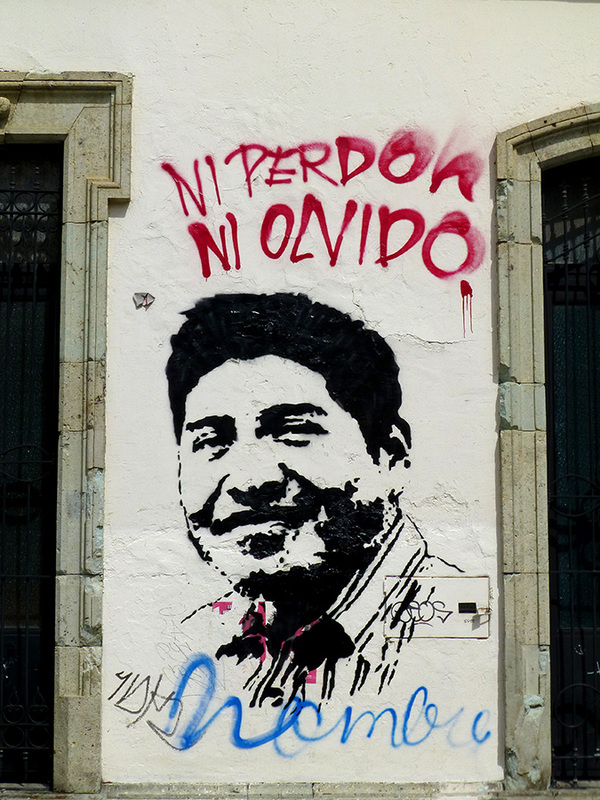 Unfortunately, here in Oaxaca city, there has been a growing intolerance by the powers-that-be to these cultural and often political expressions. 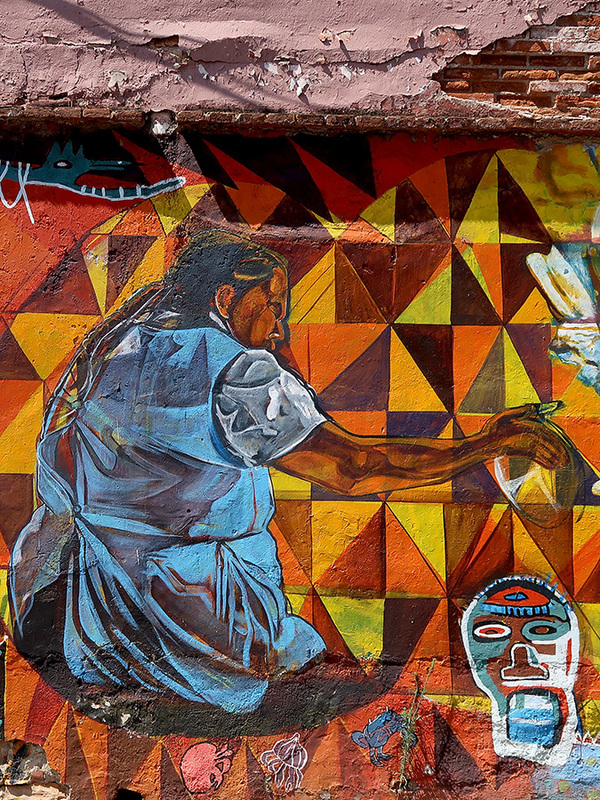 However, in Tlacolula, they seem to be encouraged and celebrated — and the Tlacolulokos collective has elevated mural painting to a high art form. I was more than a bit puzzled by the above and very prominent words featured on the mural and had to do a little research — after all, that’s what librarians do! 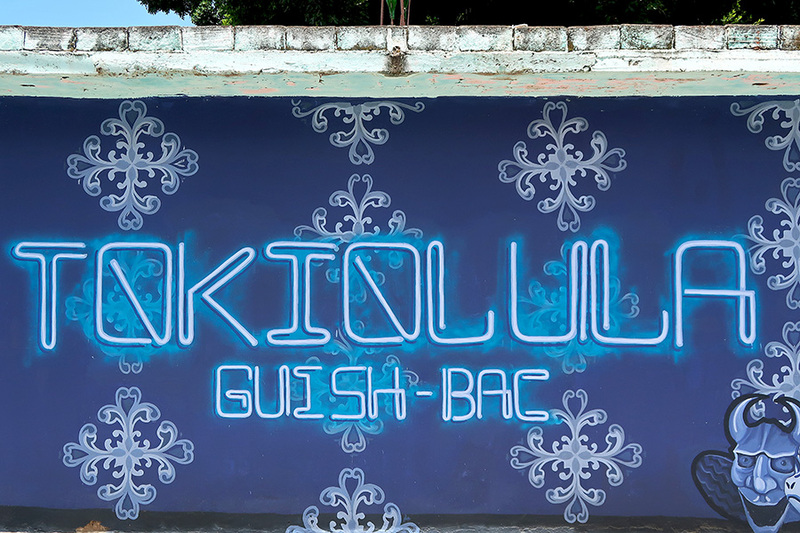 It turns out, “Tokiolula” refers to the 1960s and 1970s when the Tlacolula market was known for selling cheap and often counterfeit goods — mostly from Asia. That ended in the 1980s, but, unfortunately, has been creeping back. 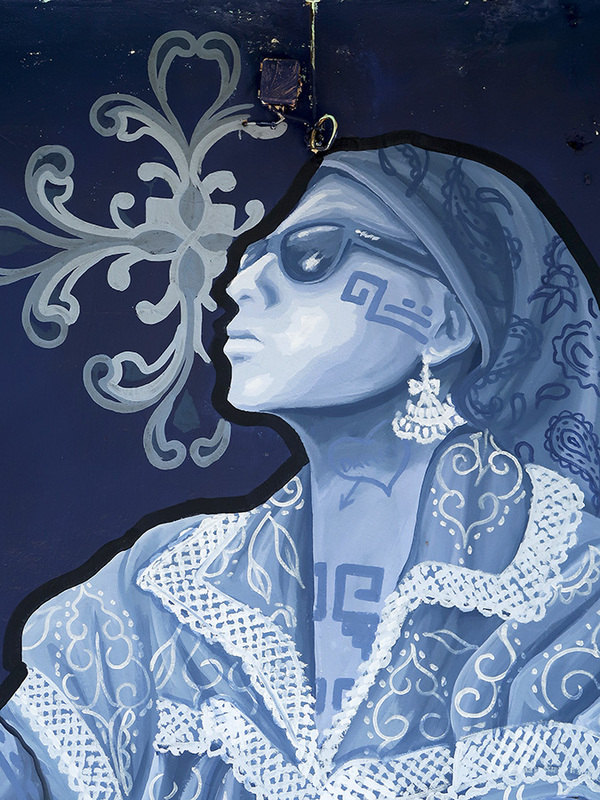 Passing Erika Santiago‘s haunting mural along the wall outside Almacén Mexicano on Calle Valentín Gómez Farías, Sad-Eyed Lady Of the Lowlands began playing in my head. 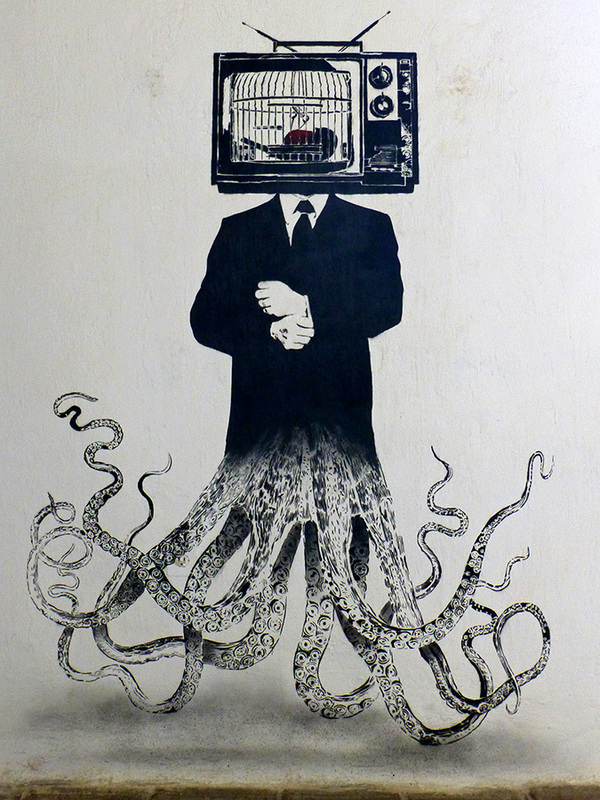 Sometimes art brings a song. And, maybe we are all a little sad these days. 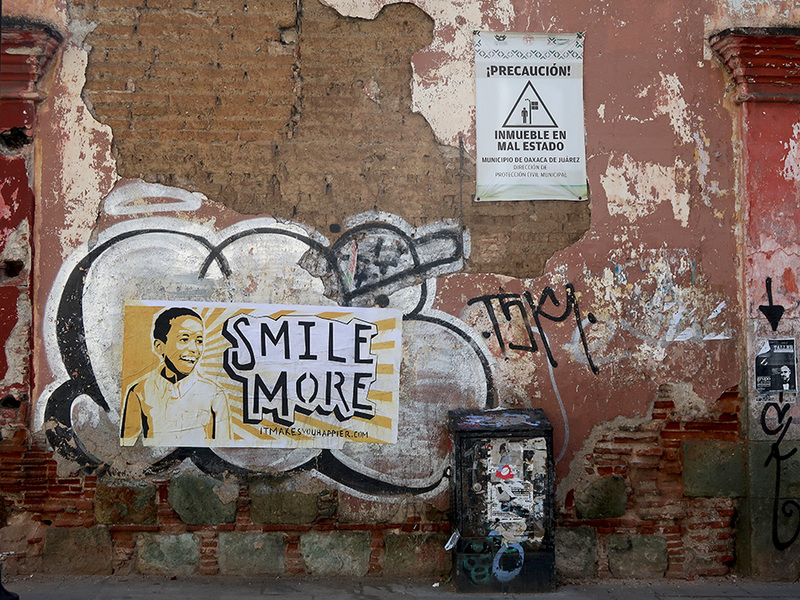 On Reforma, at the corner of Constitucion in Oaxaca — courtesy of The Positive Affect project. 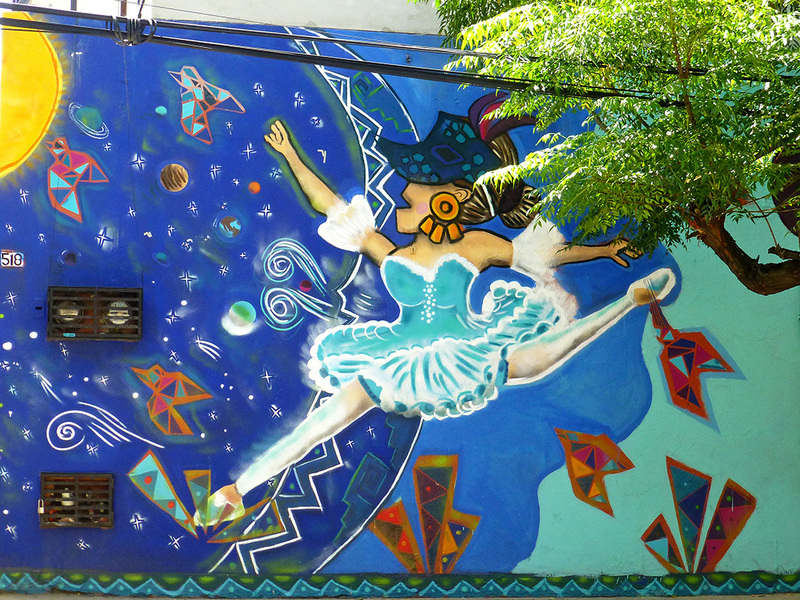 On Calle de Ignacio Allende at the corner of Tinoco y Palacios, a new mural is ready to take you on a magic carpet ride. — Magic Carpet Ride, written by Normal Cook, Robert Manuel Clivilles, and David Bryon Cole; performed by Steppenwolf. 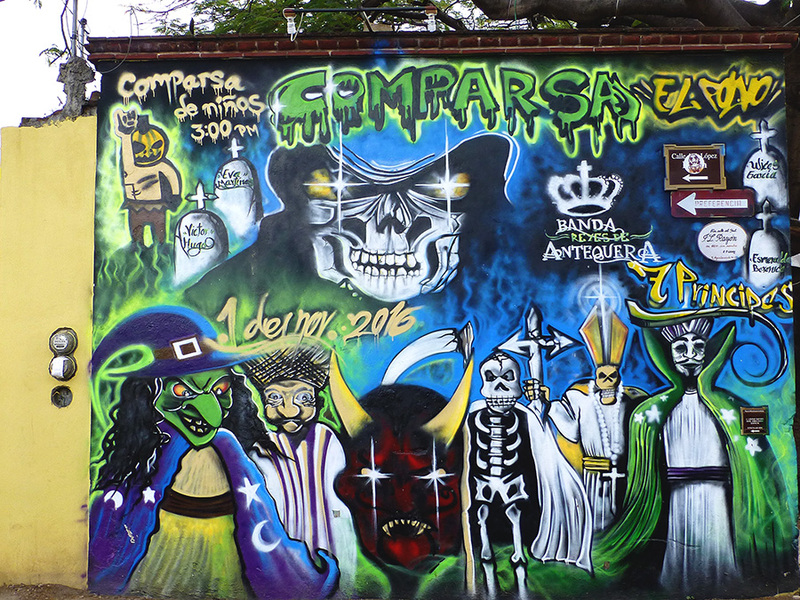 Hopefully, this mural won’t be slapped with “pintura no autorizada” signs like its predecessor. 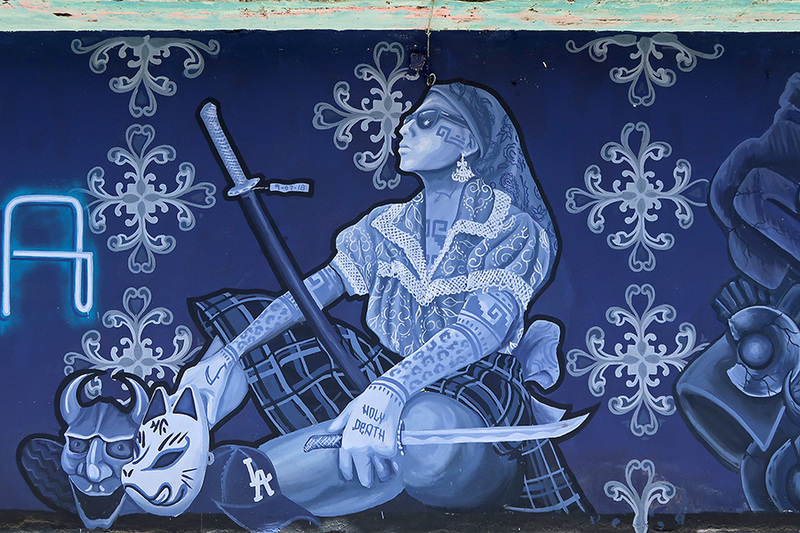 Walls of murals may be welcomed and encouraged in Tlacolula de Matamoros and Villa de Zaachila but, alas, such is not the case in the city of Oaxaca. 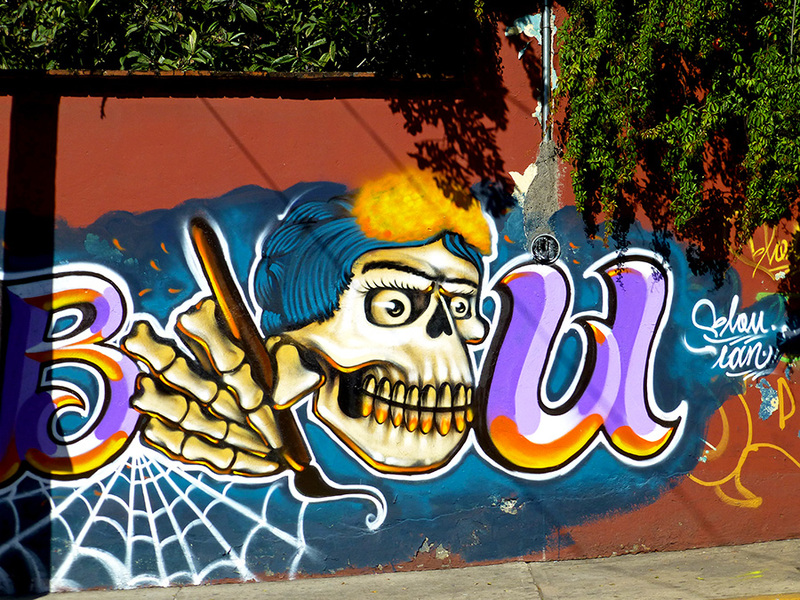 Remember the image on my Surfin’ safari post in September? And it wasn’t even finished — it is even more impressive now! 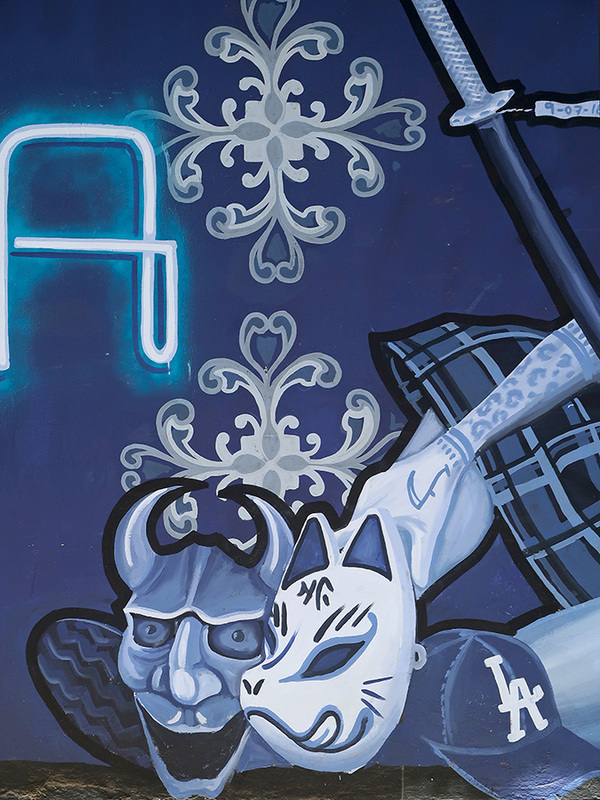 However, do you see the two sheets of paper defacing the mural? 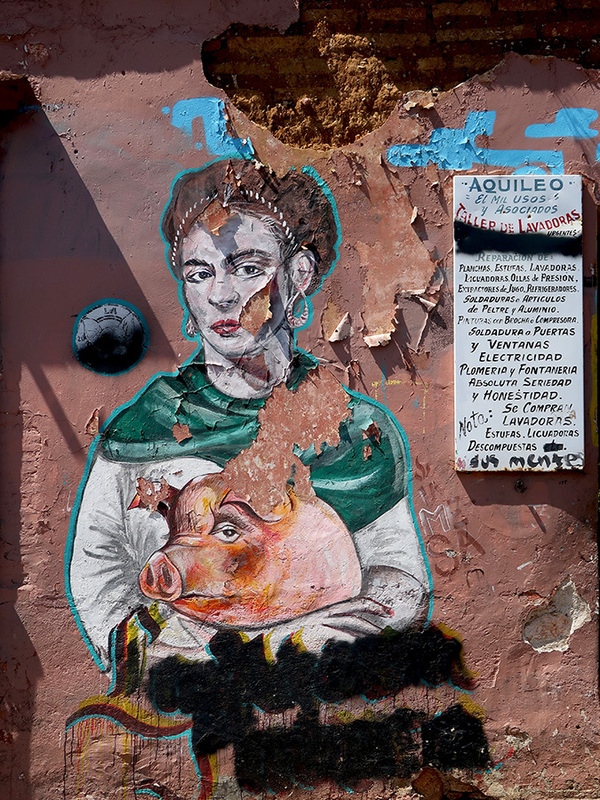 Here we go again… Like Color and culture, unwelcome and Lapiztola’s incredibly moving mural on the side of Museo Belber Jimenez, the authorities have declared this wonderful piece of art did not have their permission and will, most probably, be painted over. Don’t they have more pressing problems to deal with? 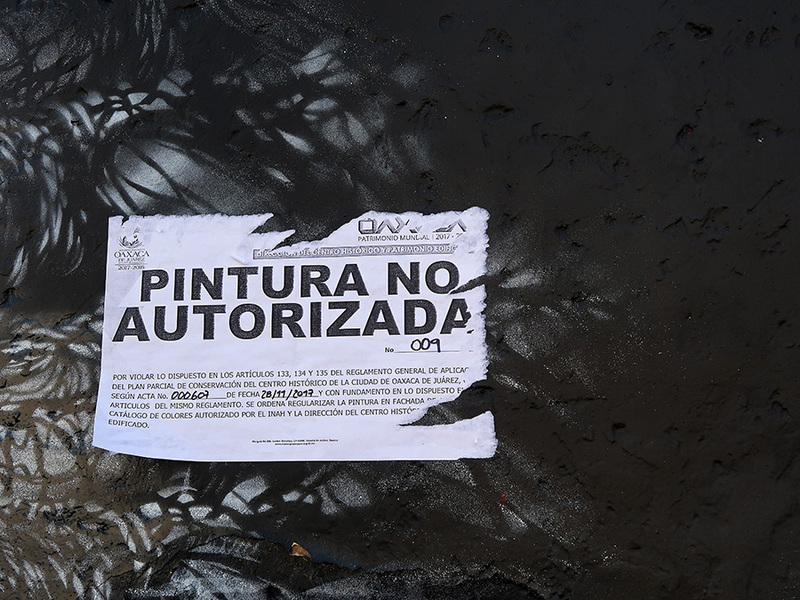 Hint: The multiple buildings “en mal estado” scattered throughout the Historic District that are in danger of collapsing onto pedestrians and drivers. 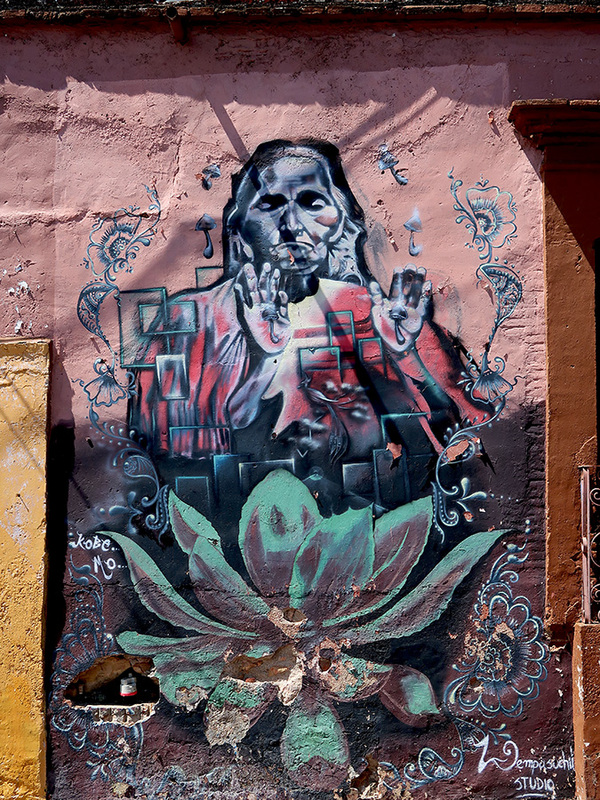 Last week in Tlacolula, as friends and I were studying the “¡Solo Dios perdona!” mural by the Tlacolulokos collective, the storekeeper next door advised us that if we liked that one, we should check out another spectacular Tlacolulokos mural a few blocks away. So we did. He was right — it was indeed stunning in SO many ways! 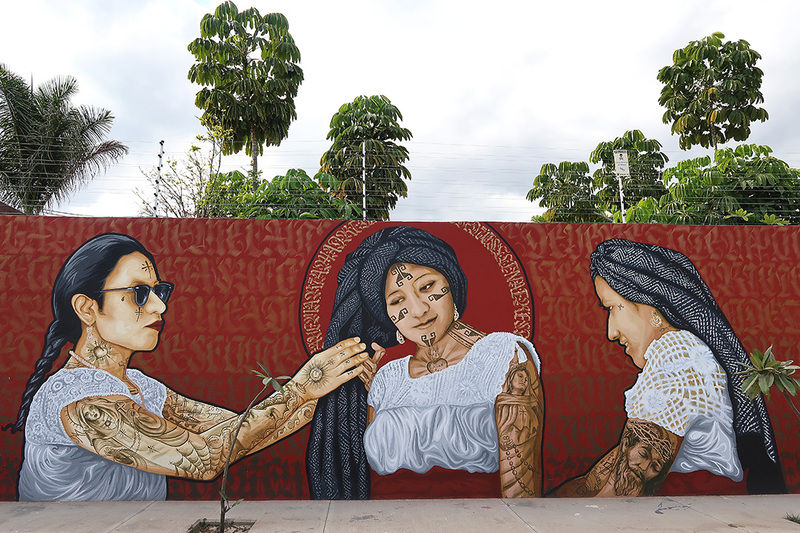 We came face-to-face with three strong, proud, and beautiful Zapotec women of Tlacolula wearing their stories. 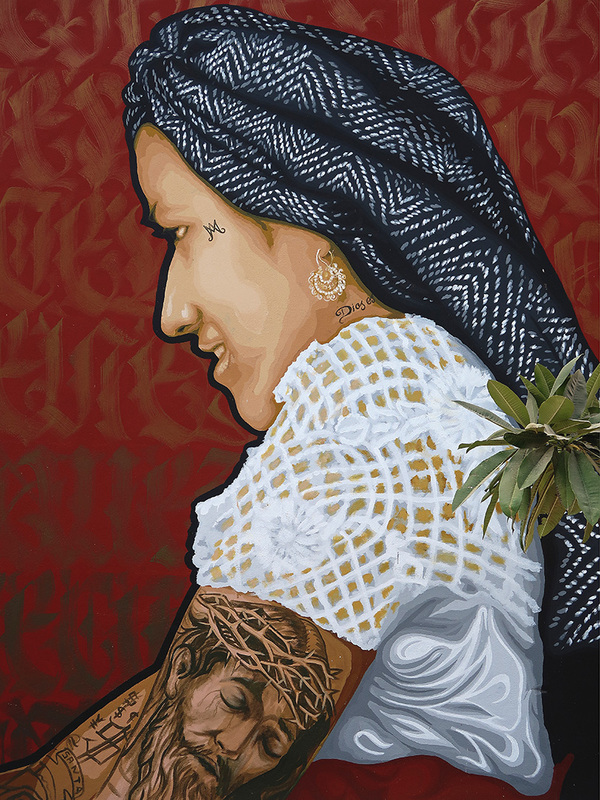 There was the traditional white blouse with its crocheted yolk, the black and white rebozo twisted into a head covering, and there were the prized gold and pearl earrings. 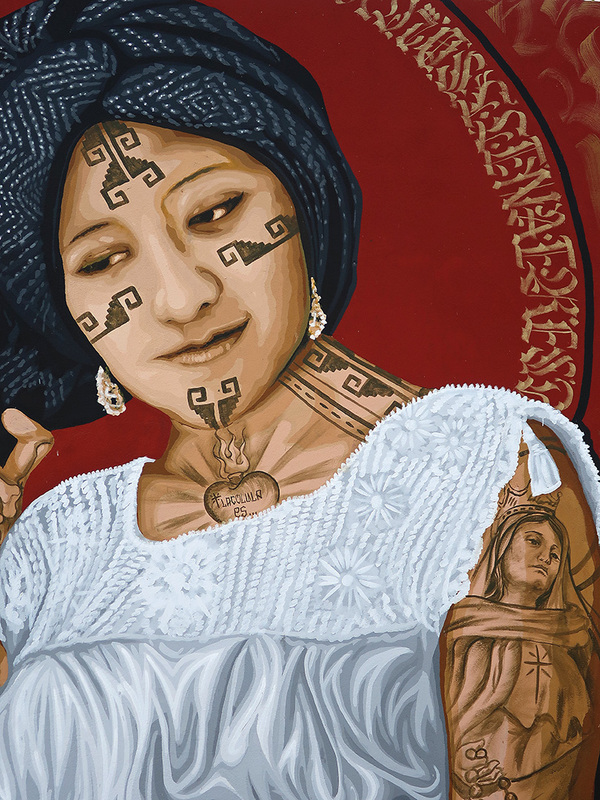 But, so too were the tattoos of iconic Catholic imagery of Virgen María and Jésus wearing his crown of thorns juxtaposed with pre-Conquest grecas of Mitla, a Spanish galleon, and the heart-dagger of betrayal. 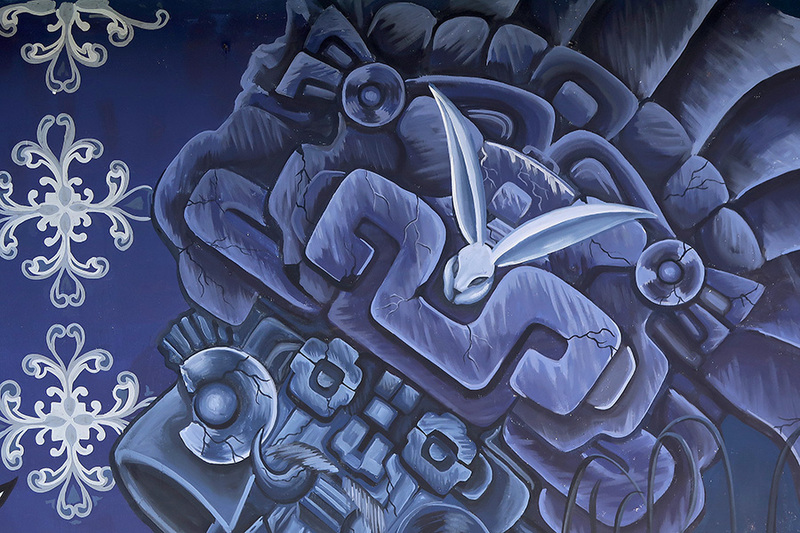 This is one powerful mural! 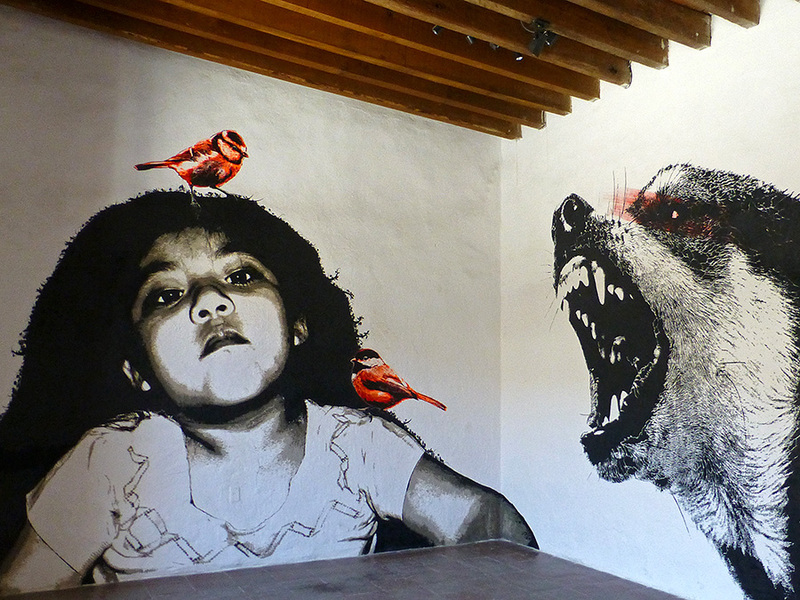 And, the story doesn’t end here in Oaxaca. 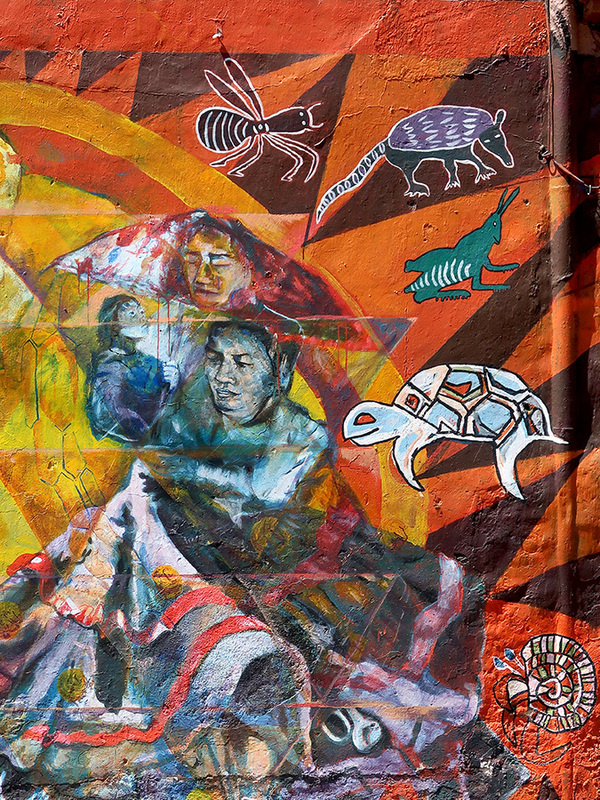 The murals at the Downtown Central Library in Los Angeles will be on exhibit in the library’s rotunda until January 31, 2018. “Cats don’t have names,” it said. 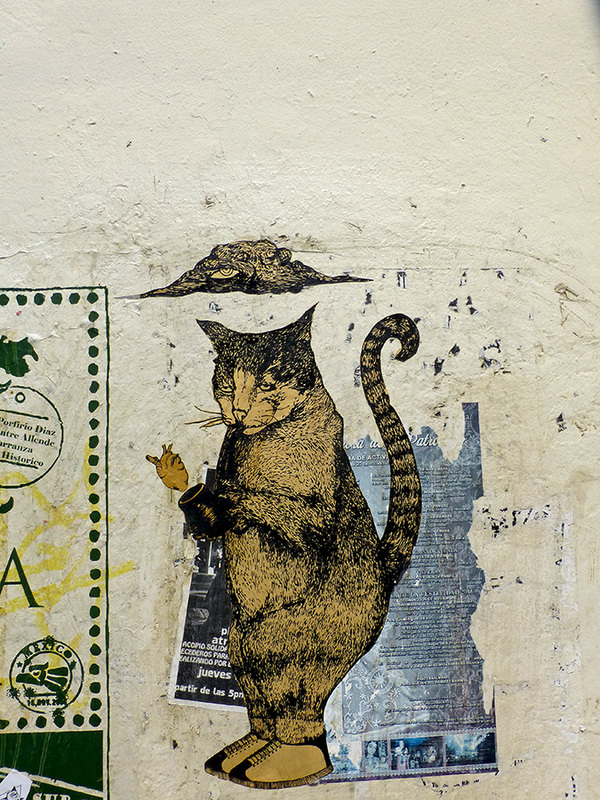 “Curiosity killed the cat,” Fesgao remarked, his dark eyes unreadable. I’m still on the East Coast, now outside of Boston. It’s cold (not freezing, thank goodness), dark by 4:30 PM, and colors are bland. 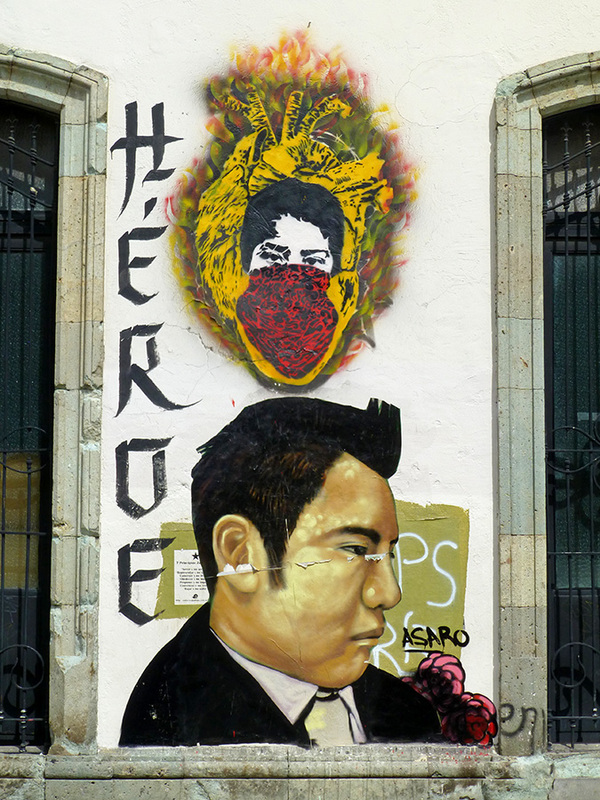 Today, as we dashed down an alley, dodging raindrops, from parking lot to restaurant, I caught a brief glimpse of a mural on the side of a building, but it seemed rather lackluster compared to the walls of Oaxaca. While I LOVE (I think that’s what the last one says) seeing my family and appreciate (more than a little) paper towels that don’t disintegrate, drinking water from the tap, and plumbing that can handle toilet paper, I’m homesick for Oaxaca. Soon! The US election results had come in and, with mixed feelings, I was preparing for a trip up into the belly of the beast, to visit family. 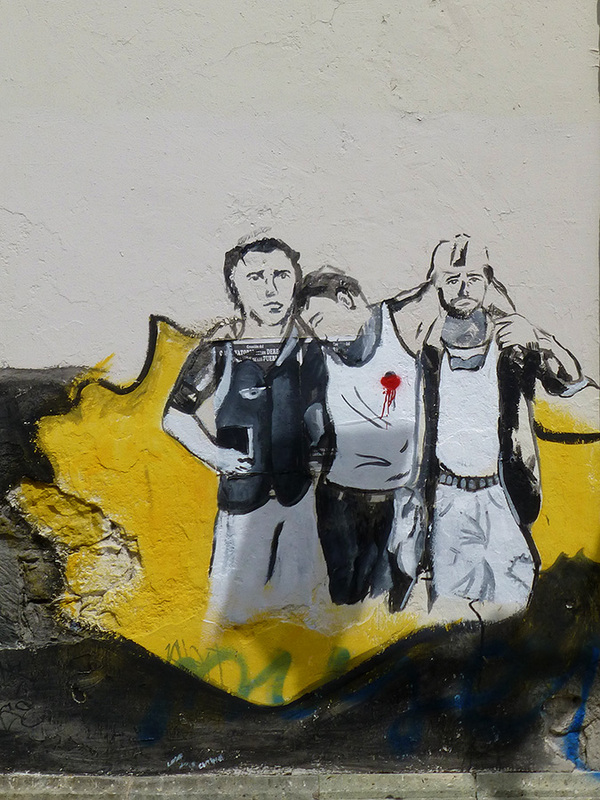 A mural seen shortly before I left, on the wall of contemporary art space La Curtiduria on 5 de mayo in Jalatlaco, seemed to speak to me. 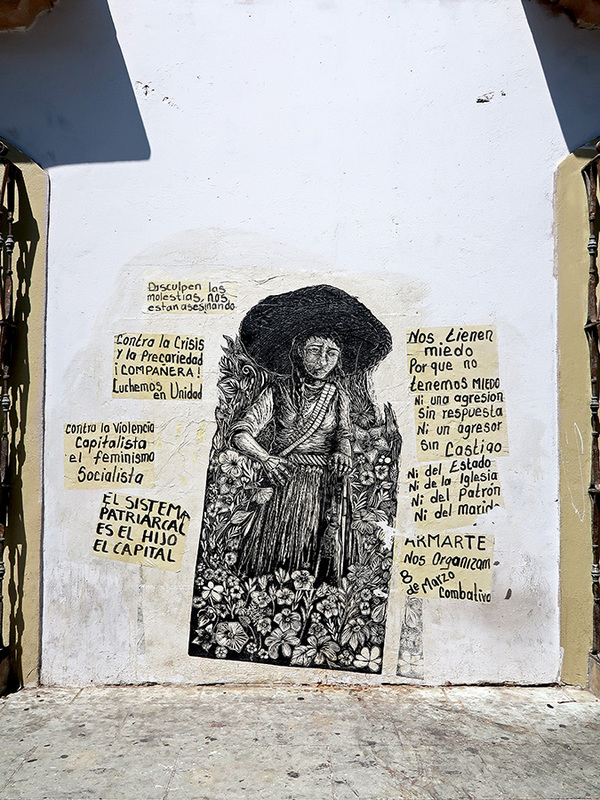 There she was, beckoning, much like the beautiful and haunting mural, We sow dreams and harvest hope on the Tinoco y Palacios wall of Museo Belber Jimenez (before it, along with others, was unceremoniously ordered removed by the city government). 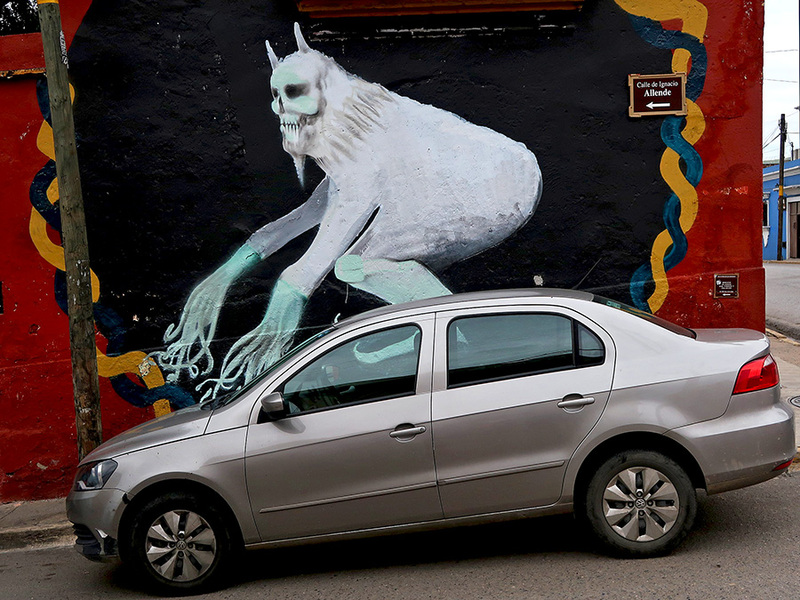 Another mural by Colectivo Lapiztola. 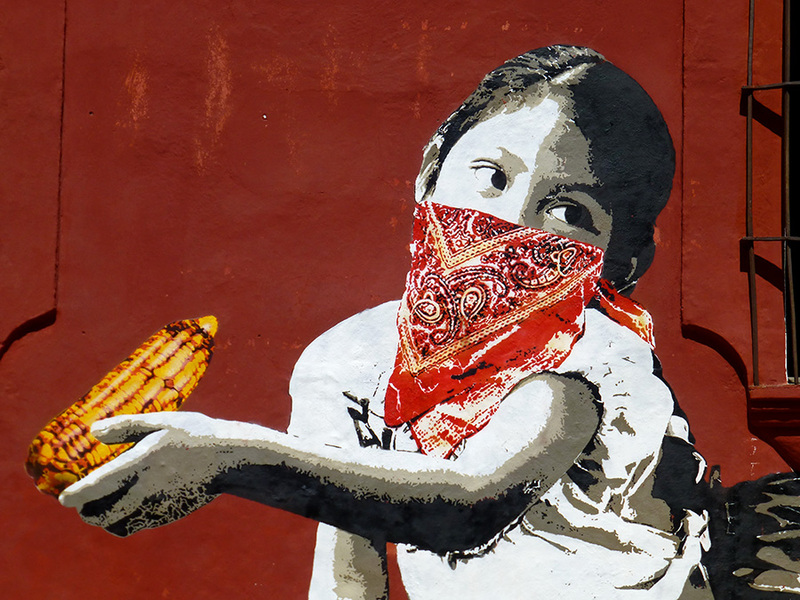 The symbolism of the corn, the bandana, and a young indigenous girl is rich in the layers of rebellion and resistance of modern-day Oaxaca. 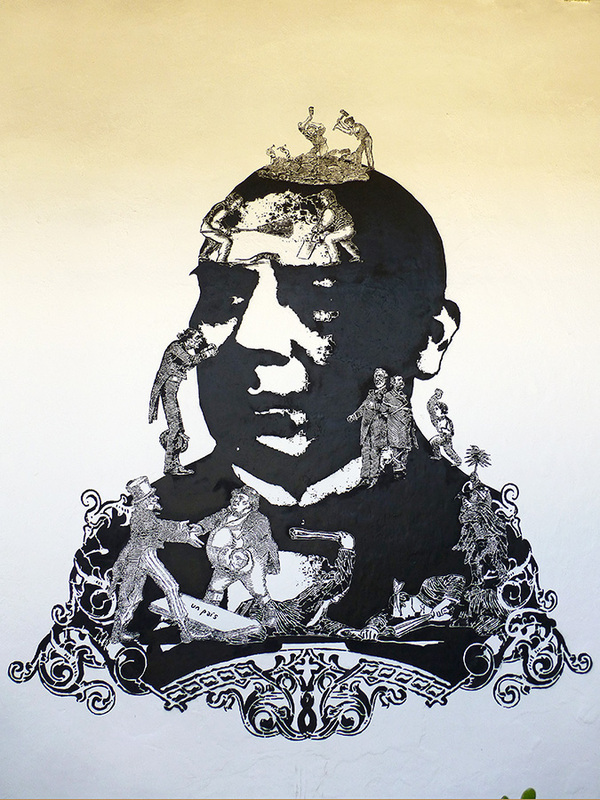 And so I went up the stairs of IAGO and into the courtyard where Benito Juárez presided over the entrance to the exhibit, Corte Aquí (Cut Here), by the Lapiztola collective. 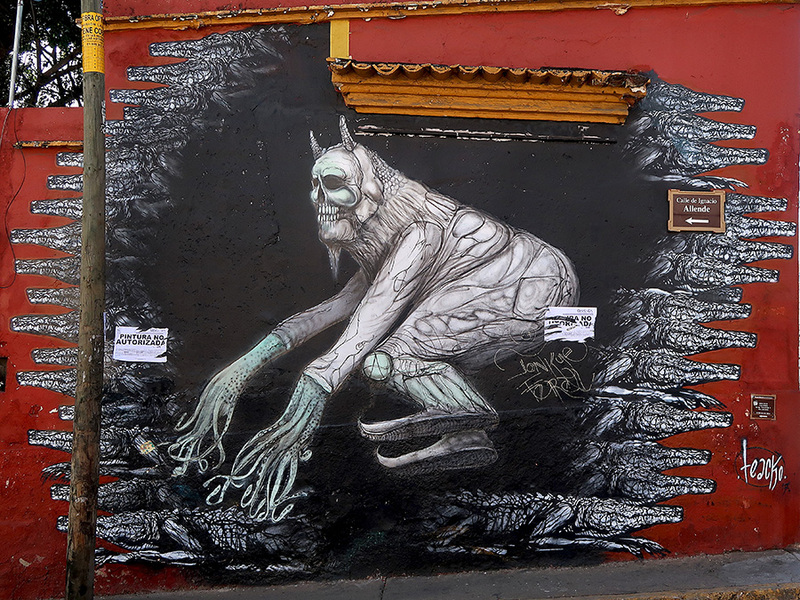 Lapiztola consists of three artists: Rosario Martínez, Yankel Balderas, and Roberto Vega. 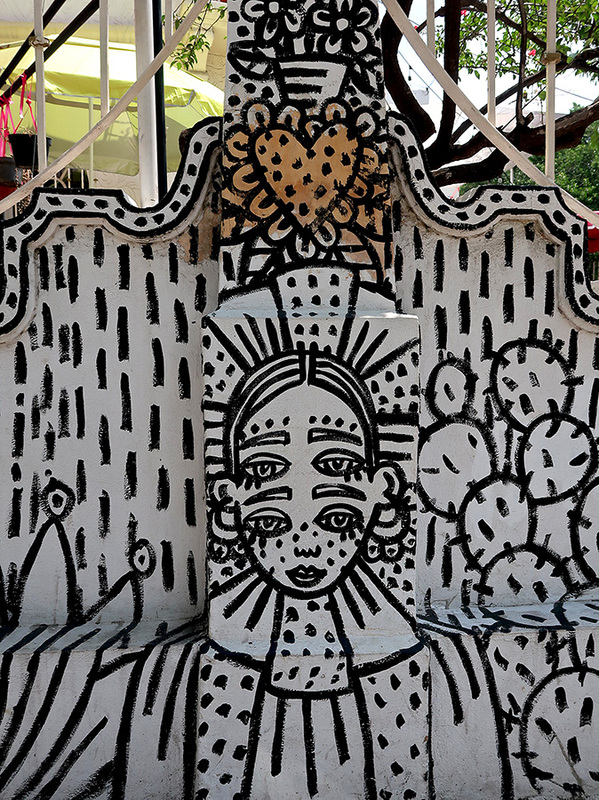 This small exhibit (3 stencils and 7 graphic works), with its larger-than-life images, covers three rooms and stimulates our hearts and our minds. 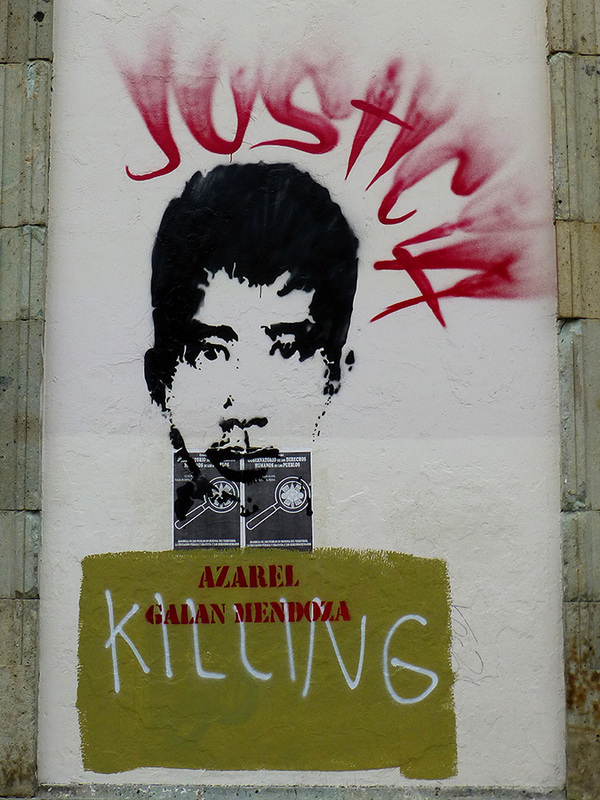 Over the past ten years, as the exhibition demonstrates, Lapiztola has taken on the issues of social protest, disappearances, the protection of natural resources, and drug-trafficking — the latter, as evidenced below. 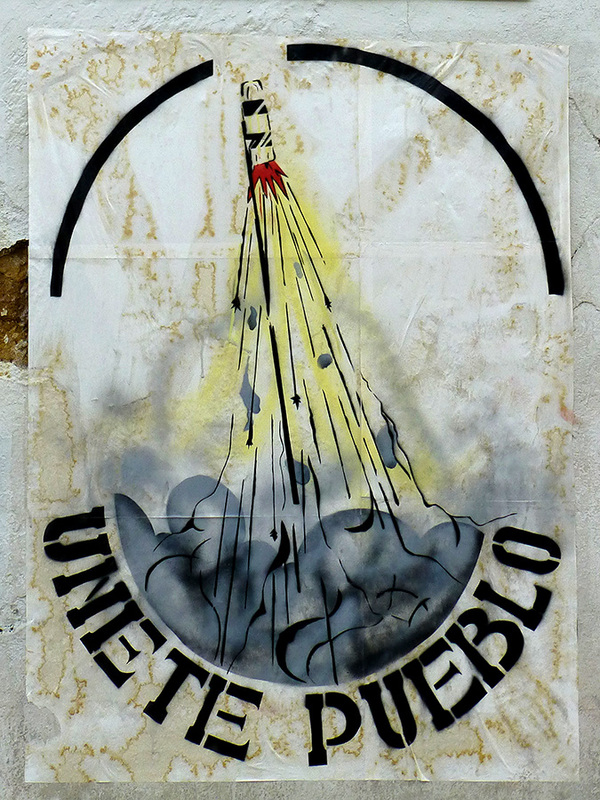 Also included, is one of the first Lapiztola images that fascinated me. 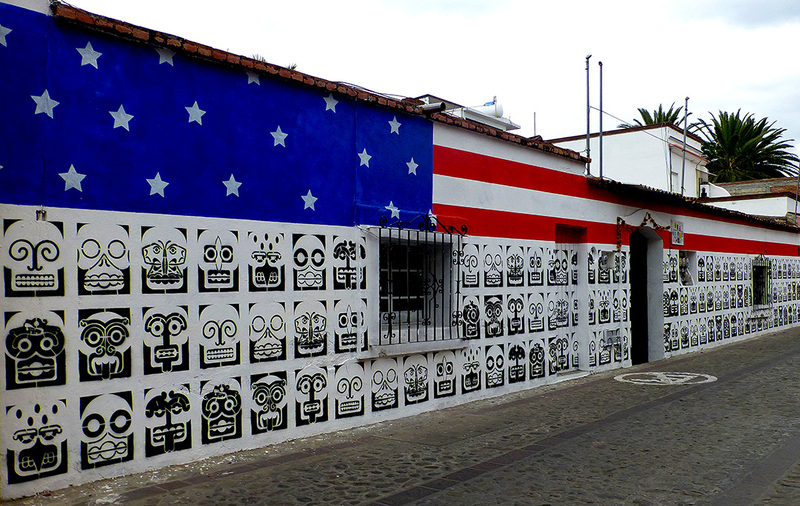 It covered the front of the Espacio Zapata in 2012 and speaks volumes about modern society. 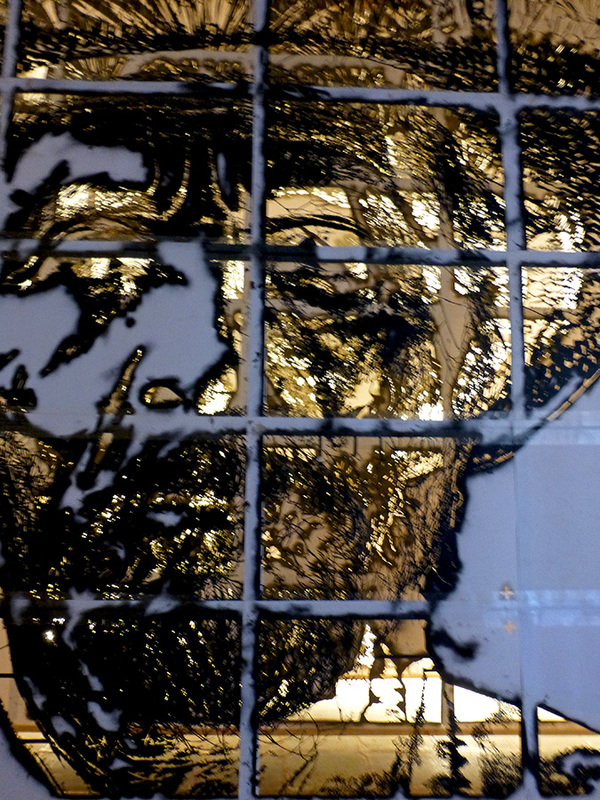 If you go to the exhibition, don’t miss the third room; in it hangs the three massive stencils (below) used to produce the brilliant mural I named the Art of Agave, celebrating the human face of agave cultivation. 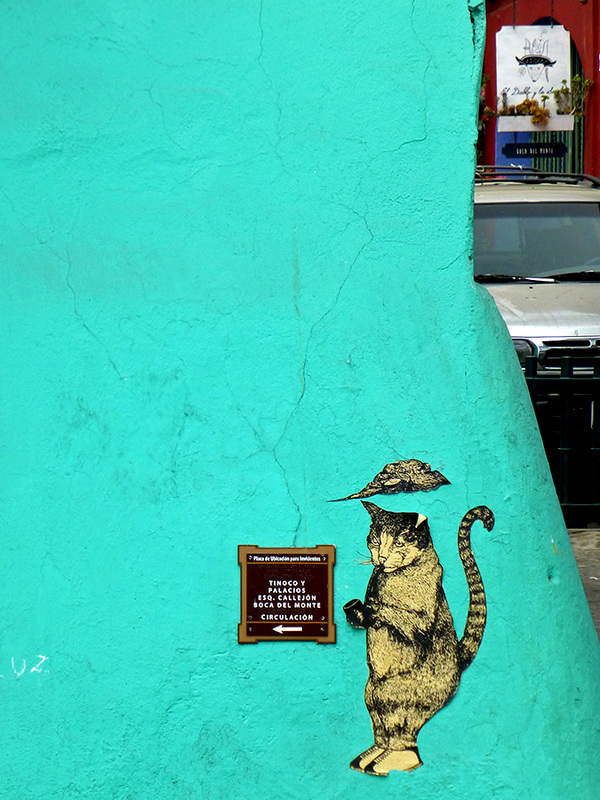 It once educated and enlivened the wall of Piedra Lumbre on Tinoco y Palacios, before it, too, was painted over. I’m not sure how long the exhibition will last. 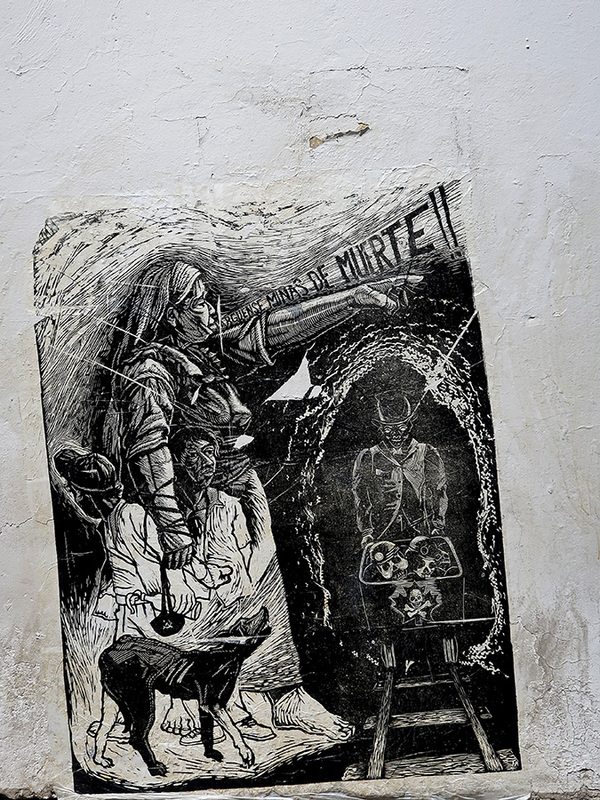 However, if you are in Oaxaca, I encourage you to pay it a visit and to all, when you are in Oaxaca, make sure to pay attention to the walls — they have something tell you. 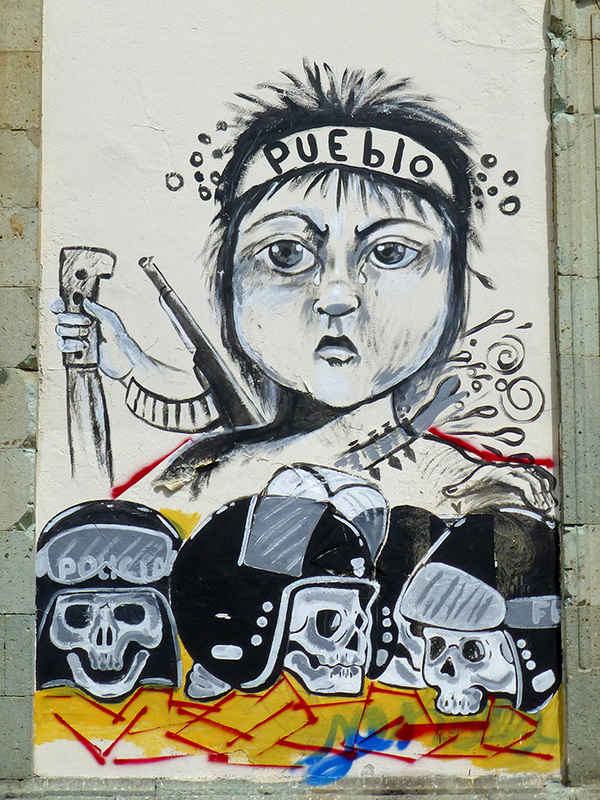 The public school fall semester is scheduled to start Monday, August 22 and, as you can see from the Oaxaca-The Year After blog post, for good reason, no one is holding their breath. 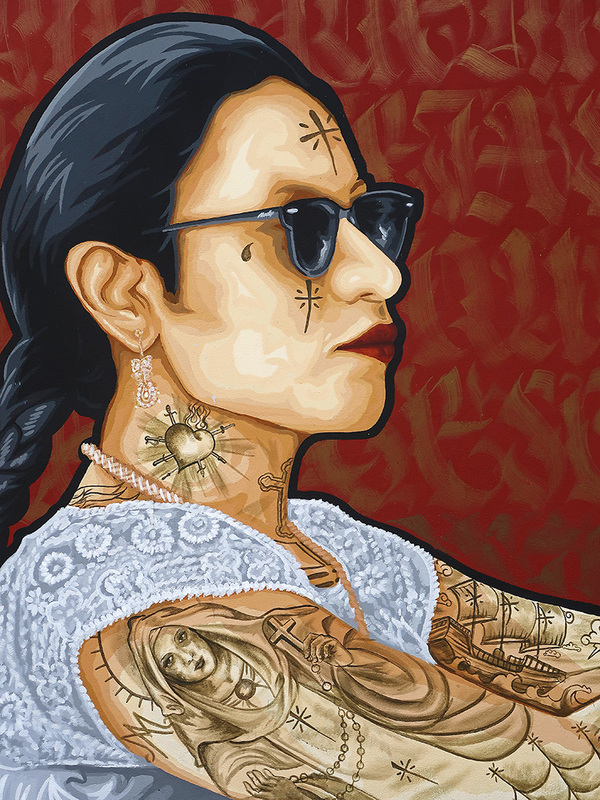 So, while we wait, take a deep breath, exhale, and watch Lila Downs performing Dios Nunca Muere live HERE. 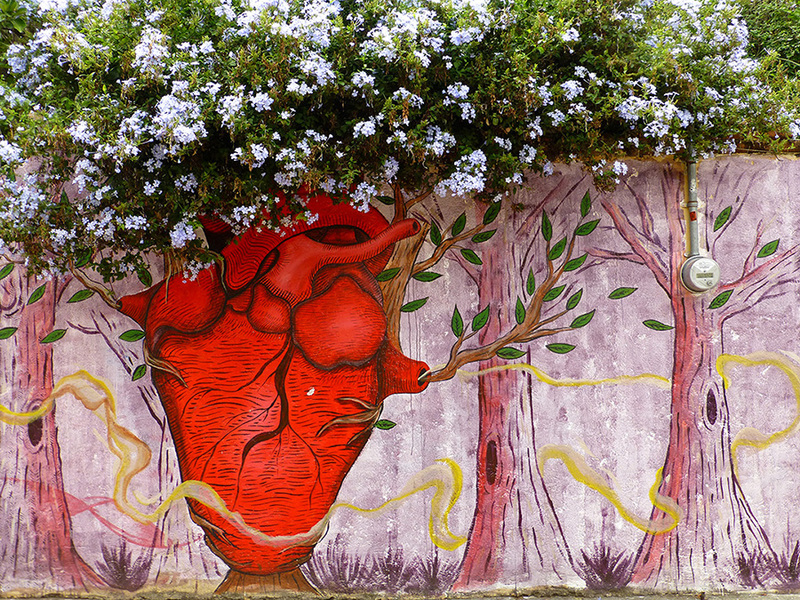 I was last on Callejón de Hidalgo about a month and a half ago and a new (to me) mural charmed me. I’ve been meaning to post photos, but there has been way too much going on and they got lost in the pictures shuffle. 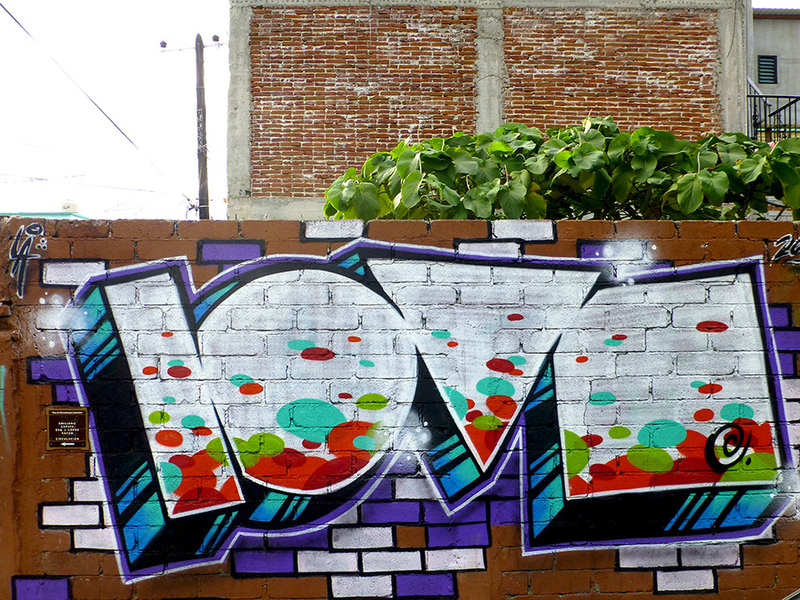 Murals are usually a “no-go-zone” for graffiti. 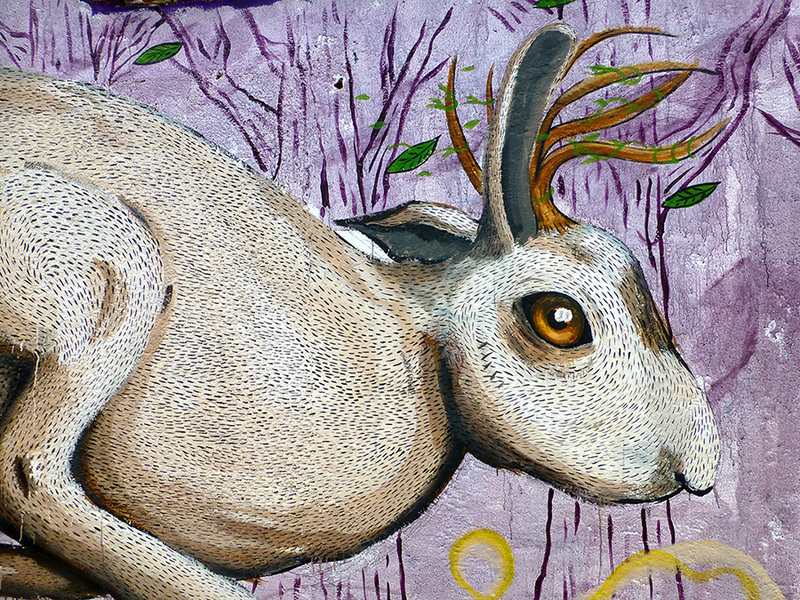 However, yesterday, walking with friends, I again found myself on that lovely little lane, but was dismayed to discover someone(s) had tagged Peter Cottontail and his tree-lined neighborhood with graffiti. 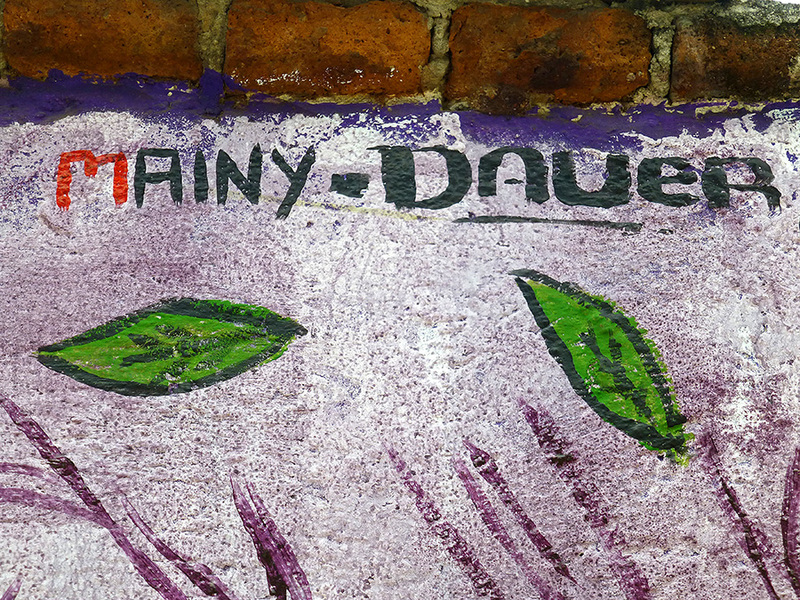 I don’t know who you are, Mainy-Dauer, but I want you to know your mural made be smile. I’m glad I have the above photos to remember it by. 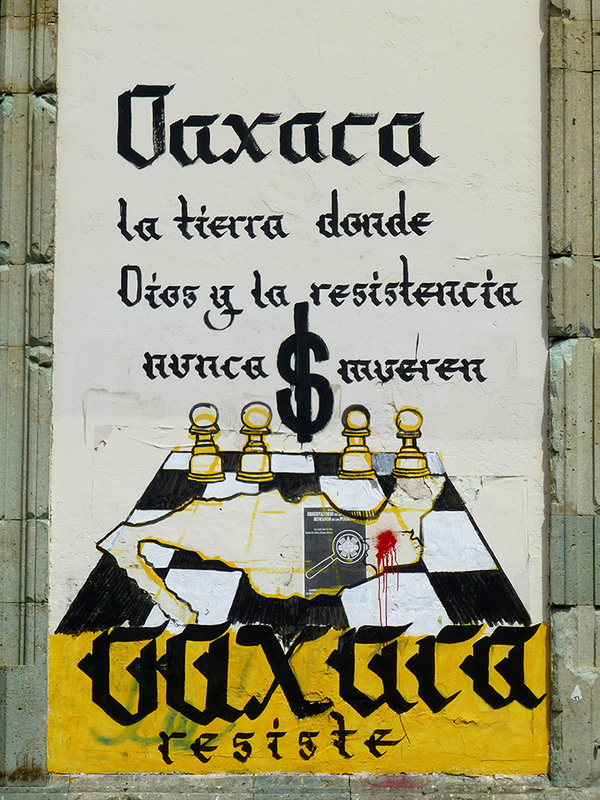 Mexico’s Interior Secretary, Miguel Ángel Osorio Chong, is refusing further dialogue with the CNTE (teachers and education workers union) until the blockades are lifted, the CNTE is vowing to intensify its actions around the country, and rumor has it that masses of vacant hotel rooms in Oaxaca (thanks to large-scale cancellations) are being filled by federal police. 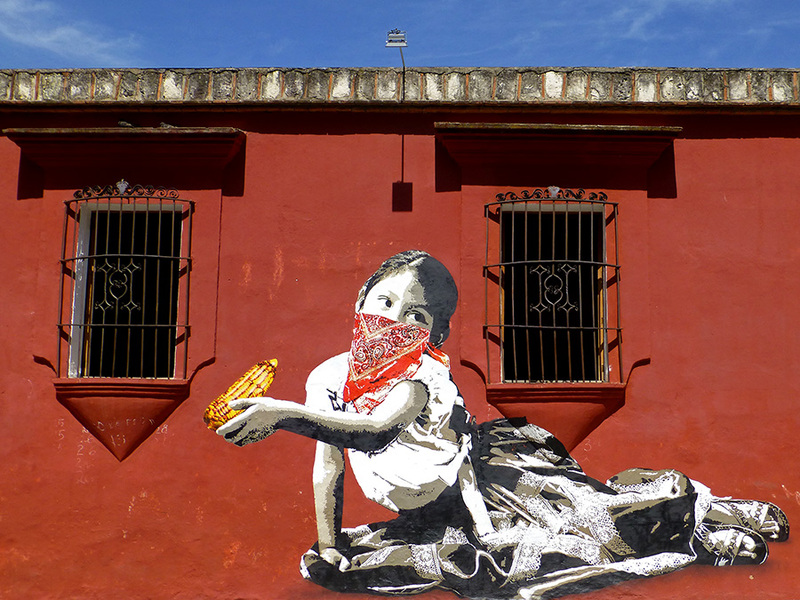 There’s a dance going on in Oaxaca, I don’t know the steps, but in the meantime, let’s put on our red shoes and dance the blues.